Adham Fisher jots down notes at the Don Mills subway station in advance of his attempt to visit every TTC station as quickly as possible. Adham Fisher holds his backpack in his hands and weaves around two men on the Union Station escalator. They do a double-take as he sprints toward the waiting train. In Fisher's world of record-setting transit riding, every second counts and dirty looks are expected. "One train missed could be the end of the fastest time," he explains. 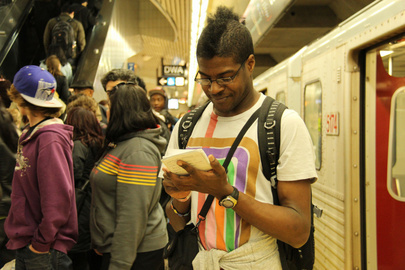 The 27-year-old Brit came to Toronto to visit every TTC subway station as quickly as possible. He tries this all over the world - and attempts official Guinness records where they exist, in London and New York. To date, he has yet to break any, but came within 19 minutes of the New York City record last week - with a time of 23 hours, 11 minutes and 24 seconds. Fisher applies the Guinness rules to every attempt, even those not officially recognized, like Toronto. He visits each station in the system and jots down the arrival and departure times from each "down to the second." He collects witness signatures every step of the way and takes photos of each station as the doors open and shut. "You have to be prepared to annoy a lot of fellow passengers, especially in rush hour," says the man who always gets on a subway car, no matter how full it is. Fisher works seasonally at Formula One campsites. He funds these transit trips out of pocket. On Wednesday, his TTC research mission does not begin well. He sleeps late on account of some residual jet lag, his phone dies, and the TTC station he visits is out of weekly passes so he has to buy a day pass, which doesn't swipe. But this is why research is important. With a notebook and map in hand, he says "aha!" frequently and jots down which subway car and door are closest to his next destination. "Carriage three, door four," he says, noting the quick getaway from the Sheppard line to Yonge. "I consider myself quite spatially aware," he says, when asked if he's ever been hit by a car. Fisher made his first all-station attempt in 2004. He doesn't know why he continues, except for the fact that it's fun. He doesn't know how long the attempt will take this Thursday. While Torontonians have made videos of visits to every station, the TTC isn't aware of any official timed record, and it appears Fisher is setting the unofficial time to beat. But Wednesday's trial run isn't leaving him very hopeful, thanks to slow buses and his lack of general TTC knowledge. "I think the whole thing will be a disaster," he says. 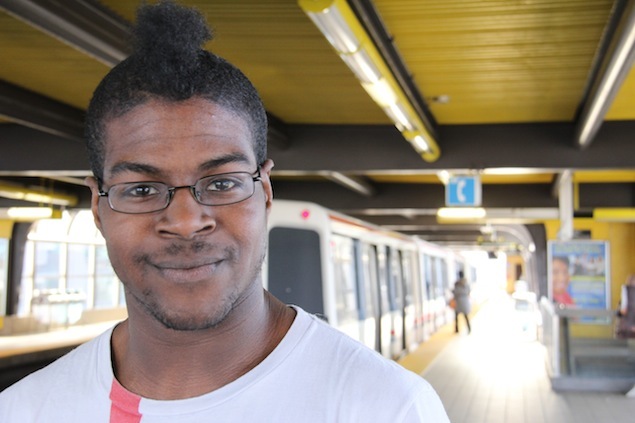 Last week, Adham Fisher attempted to ride the entire TTC subway system in record time. So how did he, um, fare? So, of all the Guinness world records to beat, why this one? I'm not talented enough to try any other Guinness record, like pushing an orange along the ground with my nose for a mile. Then again, I have not broken a transit record yet; perhaps I am not cut out for that either. I once wondered if it were possible to go to every London Underground station in one day, found out there was a Guinness Record for doing so as quickly as possible, and went from there. One also exists for New York but no other city. I do others because I want to, but with the same determination as official attempts. It is useful to go to each station where one will transfer, note the best carriage and door position to be closest to the exit, and plot the best passage to the next train. Also, to study the timetables and find out which stations have toilets. You did your transit challenge twice last week in Toronto. How did Day One compare to Day Two? My first attempt on Thursday, April 12, yielded a time of two hours, 46 minutes and 1 second, which was much better than I thought; I had originally estimated 4 hours. It might have been faster if I managed to catch a bus instead of running one stretch, but I was vaguely pleased. The second attempt on Friday, April 13, was unluckier: I took someone with me who had heard about me and wanted to see how the whole thing worked. We waited almost eight minutes for a bus at one point, then I left him behind to run to catch a train, which I missed by a few seconds; I would have come very close to the Thursday time with that one. He caught up later. At our next transfer, there were two trains in the station and the signs indicated that the one on the right platform would leave first. However, the one on the left platform departed and we noticed that the right platform had been designated the second train but there was no first-train sign for the left. That was very annoying. We finished in under three hours again: two hours, 57 minutes and 32 seconds. Did you have a most memorable Toronto encounter from the trip? There were many memorable encounters. On Thursday, my photograph was on the front page of the Metro and as I was riding the subway in the evening rush hour, many people were reading it and recognizing me: three asked me to sign their papers! The same day, I was invited to a meeting with Brad Ross, Executive Director of Communications at the TTC's head office and he showed a lot of interest in what I was doing. What are your future plans? Any chance of parlaying this into a reality show? Chicago will be my next stop to have another go at the L-train, but I seem to have started something there and the "record" has been beaten three times in as many months, so it will be difficult. If anyone seriously thinks that this is a viable option for a reality show, I will consider offers. But I am a pessimist.